Identification of any health professions that have a shortage of providers. Respiratory Care Practitioners, or commonly called Respiratory Therapists. If the shortage is being addressed and how is it being addressed? All Respiratory Therapist programs have Advisory Committees, these are where the school faculty and the hospitals / facilities that provide clinical to the students meet and discuss any issues about the program. We monitor graduation rates and the ability of graduates to pass the national registry. In these meetings the lack of Respiratory Therapists available in the workplace is discussed. The schools and the facilities will brainstorm on how to: 1. Get more students into the program if they are not filling all the positions, i.e. marketing, 2. If all positions are being filled, asking if the classes can take more students, and 3. Many facilities take any opportunity to visit middle and high schools to educate those students on what being a Respiratory Therapist is. If the shortage is not being addressed, how could it be addressed? If the state could allocate funds to recruit students into Respiratory Therapy, there is a program called the Indiana Respiratory Initiative that can be revitalized. This program is sponsored by the Indiana Society for Respiratory Care and provides valuable information about the profession and allows students to experience examples of Respiratory Therapy procedures and how a Respiratory Therapist is part of the multi-disciplinary medical team. This group has worked with AHEC (Indiana Area Health Education Centers) and will educate guidance counselors in the high schools. If marketing is done on a large scope to the state, Respiratory Therapy should be included as a valuable health care profession. The ISRC would be more than happy to work with anyone to help in this endeavor. Educate guidance counselors in grade and middle schools to guide students to college prep courses; strong math, reading, and study skills are barriers to students being successful in meeting the requirements for entry to a Respiratory training program. Example: CNA programs requires basic counting and measuring skills. Respiratory Therapy program directors report CNA’s trying to advance their careers in health care are struggling due to not having advanced math and reading skills. We formulated information based on RT departments and systems that fed us vacancy numbers. I do have this data off of job posting sites. 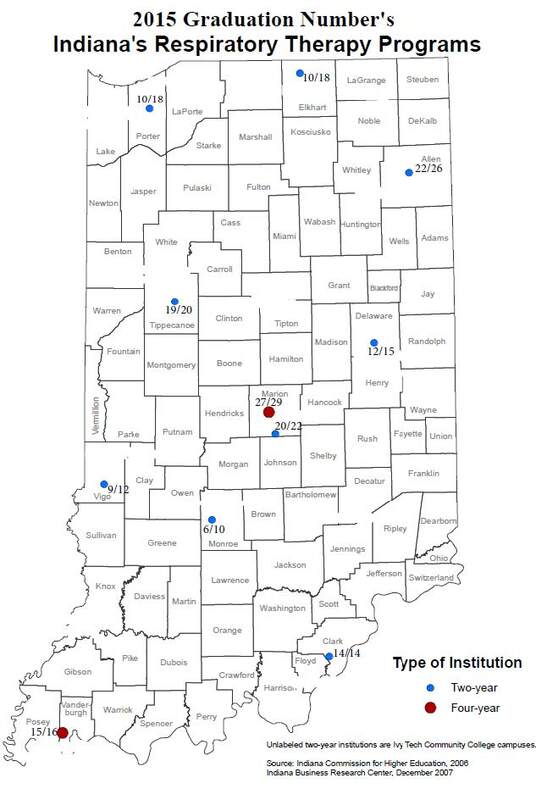 Using IU health as an example statewide we reported their current vacancy rate. Indeed: 154 Respiratory Therapy jobs posted in Indiana. LinkedIn: 127 Respiratory Therapy jobs posted in Indiana in the last 30 days. May 2016 Bureau of Labor statistics data shows Indiana: 1 of 12 states with the highest concentrations of employed Respiratory Therapists. 3,890.